Pink thought it was "kind of rad" to lose out on another Grammy award. The ‘So What’ hitmaker – who has children Willow, seven, and Jameson, two, with husband Carey Hart – was unable to attend the ceremony on Sunday (10.02.19) because her kids were ill and though her record ‘Beautiful Trauma’ lost out on winning the Best Pop Vocal Album accolade to Ariana Grande’s ‘Sweetener’, the 39-year-old singer wasn’t too upset as she just felt "honoured" to have received 20 nominations over the years. She tweeted: "I think it’s kind of rad that I just lost my 20th Grammy nomination. "I’m always honored to be included. Now to get this sick baby in the bathtub. "Congrats to all the nominees. Have fun tonight. 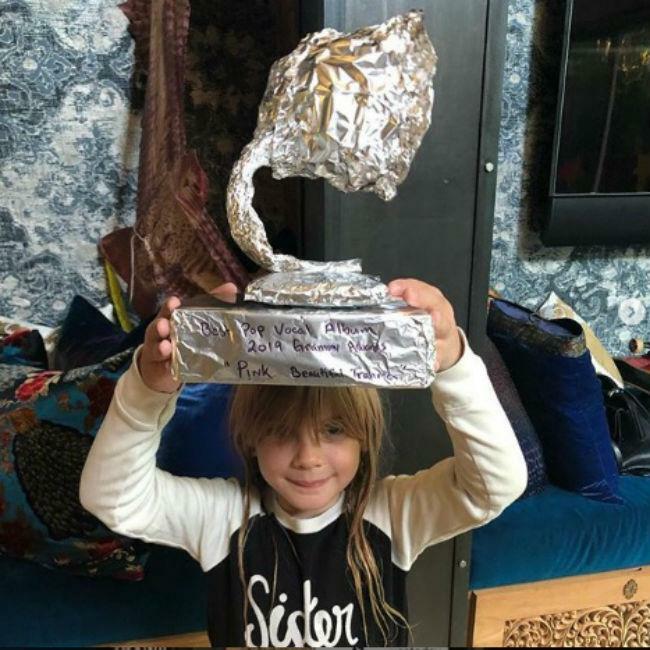 (sic)"
She shared photos on Instagram of Willow and Jameson each holding the homemade trophy – which bore the words "Best Pop Vocal Album 2019 Grammy Awards – Pink ‘Beautiful Trauma" and captioned the post: "Thanks Kids:) my favorite kind of award (sic)". She quipped: "And so, this will be my 17th tinfoil Grammy on Sunday."